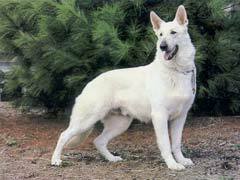 German shepherds are among the many breeds most commonly afflicted by canine hip dysplasia (CHD). German shepherd hip dysplasia is transferred genetically, just as it is with gold retriever hip dysplasia, and forms of the condition that effect other breeds. The disease causes a deterioration of the ligaments that helps secure the joint and usually begins early in a dog’s life, even though hip dysplasia in dogs will generally not be obvious until much later. There are treatments for German shepherd hip dysplasia, both conventional and holistic. The more conventional dog hip dysplasia treatment includes painkillers, and if necessary, surgery. Holistic treatments focus on herbal supplements which can provide pain relief for dogs, and in some cases show reparation of the joints and a higher quality of life for the afflicted canine. However, there is no actual cure for German shepherd hip dysplasia. The best that science can currently offer other than treatment is preventing the spread of the genetics in which the disorder occurs. There are tests to determine if your dog may be at risk, and catching the disease early on can help improve your dog’s ability to cope with the condition. When adopting, even when not planning to breed the dog, always choose to do business with a breeder who can certify an absence of German shepherd hip dysplasia in the dog’s line at least three generations back. Only by demanding healthier stock and discouraging the breeding of dogs with poor hips can canine hip dysplasia decrease.